would have required a 2018 referendum in which voters would decide whether to make the chairman a publicly elected post or leave it for other county board members to decide. 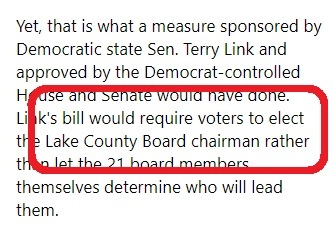 would require voters to elect the Lake County Board chairman rather than let the 21 board members themselves determine who will lead them. Wisely, Gov. Bruce Rauner recognized the legislation for the presumptuous overreach that it is and vetoed it last week. Lawmakers could consider whether to override him, but there don't seem to be enough votes in the House for such an effort to succeed. Good. To be sure, requiring Lake County voters to elect their County Board Chair is one thing. And requiring a referendum to ask those same voters to decide the matter, is another thing entirely. And while the Daily Herald may have applauded Gov Rauner for vetoing the former, in point of fact he vetoed the latter. When asked to explain the mixup, one spokesman said: "Well sure, if the editors had read their own story in the pages of the Daily Herald they would have understood the Bill. But who reads the Daily Herald?" The Daily Fishwrap once again living up to its reputation.